Background: Public health agencies in the USA are increasingly challenged to adopt Quality Improvement (QI) strategies to enhance performance. Many of the functional and structural barriers to effective use of QI can be found in the organizational culture of public health agencies. The purpose of this study was to assess the impact of public health practice based research network (PBRN) evaluation and technical assistance for QI interventions on the organizational culture of public health agencies in Georgia, USA. Methods: An online survey of key informants in Georgia’s districts and county health departments was used to compare perceptions of characteristics of organizational QI culture between PBRN supported QI districts and non-PBRN supported districts before and after the QI interventions. The primary outcomes of concern were number and percentage of reported increases in characteristics of QI culture as measured by key informant responses to items assessing organizational QI practices from a validated instrument on QI Collaboratives. Survey results were analyzed using Multi-level Mixed Effects Logistic Model, which accounts for clustering/nesting. Results: Increases in QI organizational culture were consistent for all 10- items on a QI organizational culture survey related to: leadership support, use of data, on-going QI, and team collaboration. Statistically significant odds ratios were calculated for differences in increased QI organizational culture between PBRN-QI supported districts compared to Non-PBRN supported districts for 5 of the 10 items, after adjusting for District clustering of county health departments. Conclusions: Agency culture, considered by many QI experts as the main goal of QI, is different than use of specific QI methods, such as Plan-Do-Study-Act (PDSA) cycles or root-cause analyses. The specific use of a QI method does not necessarily reflect culture change. Attempts to measure QI culture are newly emerging. 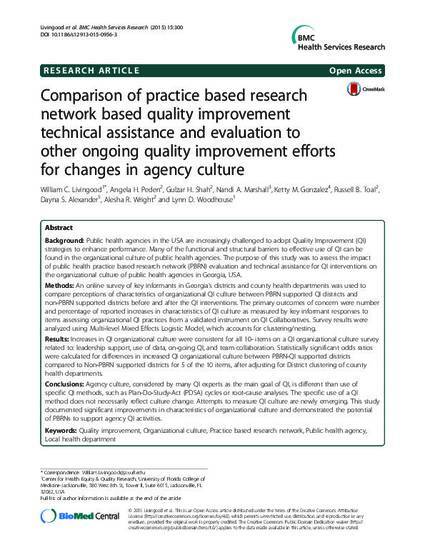 This study documented significant improvements in characteristics of organizational culture and demonstrated the potential of PBRNs to support agency QI activities. Copyright Statement: © Livingood, et al. 2015. This is an Open Access article distributed under the terms of the Creative Commons Attribution License (http://creativecommons.org/licenses/by/4.0), which permits unrestricted use, distribution, and reproduction in any medium, provided the original work is properly credited. The Creative Commons Public Domain Dedication waiver (http://creativecommons.org/publicdomain/zero/1.0/) applies to the data made available in this article, unless otherwise stated. Article obtained from the BMC Health Services Research.